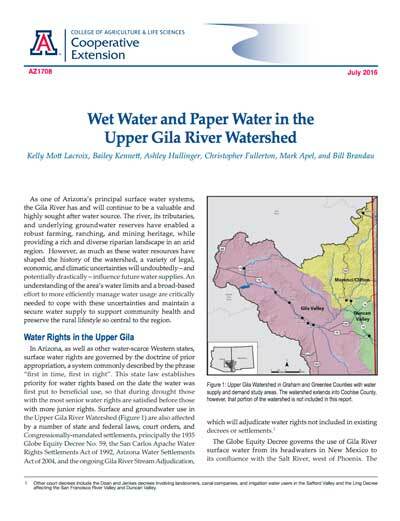 As one of Arizona’s principal surface water systems, the Gila River has and will continue to be a valuable and highly sought after water source. The river, its tributaries, and underlying groundwater reserves have enabled a robust farming, ranching, and mining heritage, while providing a rich and diverse riparian landscape in an arid region. However, as much as these water resources have shaped the history of the watershed, a variety of legal, economic, and climatic uncertainties will undoubtedly – and potentially drastically – influence future water supplies. An understanding of the area’s water limits and a broad-based effort to more efficiently manage water usage are critically needed to cope with these uncertainties and maintain a secure water supply to support community health and preserve the rural lifestyle so central to the region.